October 28 marked the 50th anniversary of the beginning of the end for New York’s old Pennsylvania Station. It took three years and countless hours of manpower to tear down what was the fourth-largest building in the world. In remembrance of the station, last Wednesday the Center for Architecture held the event, Lights, Camera, Demolition: Penn Station Recalled on Stage & In Pictures. The highlight was a reading of a The Eternal Space, a new play about the unlikely relationship between two men – a construction worker photographing the station as he tears it down and an aging professor determined to save it. Photographs documenting the entire life of Penn Station–some famous, some never seen–are critical to the play, serving as a background for the actors, silently telling the story of a changing city and offering their own compelling provocations alongside a compelling debate about progress, preservation, and of course, Pennsylvania Station. Following a reading of the play, a panel was convened to discuss the station, its legacy, and the photographs that continue to inspire. Panelists included playwright Justin Rivers, myself, noted biographer of Penn Station Lorraine Dhiel, and renown photographer Norman McGrath, whose vast archive of personal photos includes hundreds of never-before-seen images documenting the demolition of Penn Station, photos that feature prominently in the play (and in this post). Pennsylvania Station was designed by McKim, Mead, and White in 1902. McKim, a Beaux-Arts educated architect and co-founder of the American Academy in Rome, was the lead designer on the project which was a grand display of his idiosyncratic Beaux-Arts Classicism. He draws inspiration from the great train stations of Europe, the Baths of Caracalla, John Soane’s Bank of England, and surely myriad other sources, all artfully combined into a monumental pink granite structure. It was a testament to the our technological prowess, craftsmanship, and artistry. It was a monument to our culture; a station scaled to the ambitions of a country at the peak of its power – a modern Rome. And indeed, at times it seemed that all tracks lead to New York – or, to be more specific, Penn Station. It was to be a gateway to the city. McGrath’s color photos of Penn Station’s demolition capture the vast spaces in all its Piranesian glory and communicate a sense of its scale in an almost morbid way. The demolition may have been an ignoble end to a truly beautiful building but it was undeniably sublime. By the time of its demolition, Penn was full of unsightly newspaper kiosks, advertisements, and an jarring, modernist ticket counter that drastically changed the circulation through the building’s waiting room. But that is not the Penn Station we remember. There’s a line in The Eternal Space about a soldier who died in World War II: “how perfect he seems in death.” The same could be said about the station. Penn Station lives on through widely distributed photographs depicting the station at the peak of its monumental grandeur, such as those seen at the top of this post. The Penn Station we miss–even those of us who weren’t even a gleam in our father’s eye at the the time of its demolition–is one that hadn’t existed for a long time. And yet, these photos create a longing. Wednesday night it occurred to me that contemporary architectural renderings serve a similar purpose. A good rendering of a beautiful design evokes a sort of reverse nostalgia; not a longing for something that’s gone, but a longing for something to exist. They can be incredibly convincing and they can reach a massive audience incredibly quickly. Renderings have become powerful tools for architects, planners, and developers. Are they informative? No doubt. Are they manipulative? Maybe a little. After all, the nostalgia-provoking photos of old Penn were/are manipulative in their own way. Images of a pristine Penn Station were used by advocacy groups to sway public sentiment and garner support for new policy, eventually leading to new legislation and the formation of the Landmarks Preservation Commission – the first organization in the city empowered to protect New York’s architectural heritage. Images have power. Even before this recent discussion about moving Madison Square Garden, Penn Station has had a hold on New Yorkers’ imagination thank largely to its photographs. As for its future – what should a modern Penn Station be like? Should there even be a new Penn Station? Those are questions people will be asking a lot over the next 10 years. Architects will talk about sustainability and new technologies and radical formal possibilities, and civic space –all important considerations to be sure– but at the end of the day, if there is going to be a new Penn Station it should be beautiful. It needs to satiate that longing and mitigate that sense of loss felt every time we see a picture of what was or an image of what could be. 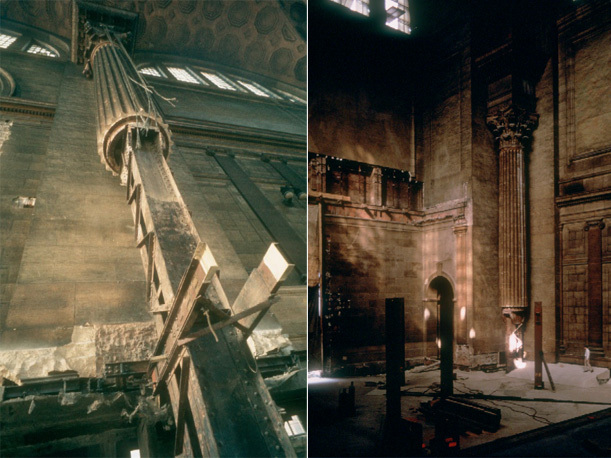 Previous PostPrevious On Preservation, Progress, and Penn Station.